Guava Island is another energetic work of art and pan-African identity from multi-talented artist Donald Glover and his close collaborators, director Hiro Murai and brother/writer Stephen Glover. Filmed in Cuba and set on the eponymous fictional tropical locale, Guava Island repurposes various Childish Gambino songs for an extended music video meets short narrative concert film performance hybrid with an obvious anti-capitalist bent. 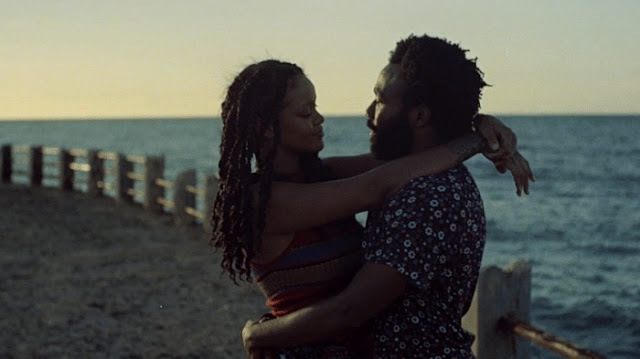 Co-starring a non-singing Rihanna and Letitia Wright, Guava Island has a very obvious tropical look and feel as the characters prepare for a concert festival where Glover's Deni is excitingly anticipated to perform. We follow the seemingly light but real everyday concerns of various workers as they prepare to go out. Deni exclaims how they live in a paradise yet nobody has the time or means to actually enjoy it. The short feature has a strong island vibe and warmth filmed on beautiful, grainy 16mm film by cinematographer Christian Sprenger in the boxy 4:3 Academy aspect ratio as it captures a certain nostalgic spirit of concert films and hangout stories. At a scant fifty-five minutes long, the Glover brothers and Murai purposely keep a stylish fadedness to the island happenings with bursts energy. While slight and breezy in feel, Guava Island is another vibrant showcase of Glover's many talents while wrapping his musical abilities and performance into a pleasant cinematic package. It's an appealing depiction of his Childish Gambino persona with enough flourishes to make it pop. Guava Island is available for streaming on Amazon Prime Video.